Back in September I had a contest for my birthday. The prize was a cross stitched piece made custom for the winner. The winner, Lynn, was subjected to a bunch of questions from me so I could figure out what to make for her. Some of the things she mentioned that I really gravitated toward were Oscar Wilde, the Victorian era, and her favorite colors (orange, yellow, purple). The colors really reminded me of fall and in particular some scrapbook paper I have. So the color palate was taken care of before anything else. I'd never read anything by Oscar Wilde before, so I spent some time looking up quotes and downloading things for my Kindle. 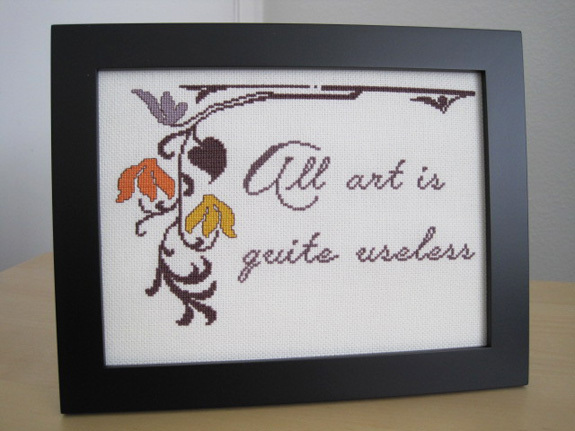 The quote I originally wanted to stitch was "It is only the modern that ever becomes old fashioned", which I thought would be fun to stitch since needlework is generally considered old fashioned. Unfortunately the quote was just too long, so I went with something shorter (and probably way more common). 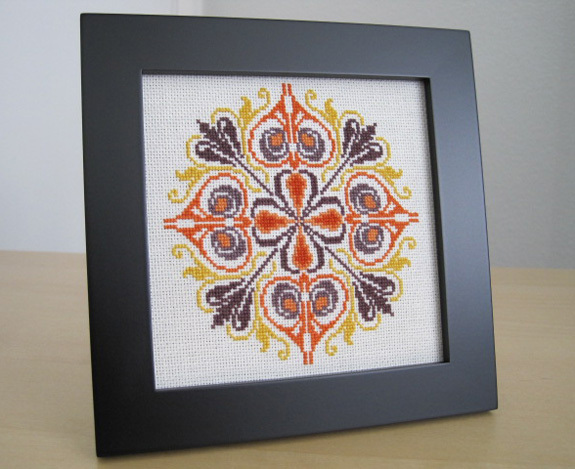 The pattern is adapted from one I found at the Antique Pattern Library. When I finished the pattern, I wasn't really happy with the way I used the colors, so I decided to stitch something else and really focus on that. The medallion is from the same pattern as the one I adapted for the Shaun of the Dead piece. It's from 1826, so not quite the Victorian era and the pattern is Danish rather than British, so I'll file that under close, but not quite.